Home - Paste content of a log file into the text box in this tab. 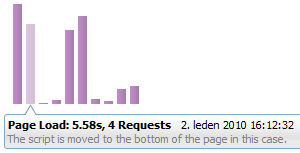 Preview - Switch to this tab if you want to see visualised HTTP traffic. HAR - Use this tab to see structure of the input JSON data as an expandable tree. About - About the tool. Schema - Explore format of the input log in this tab. HAR File Structure Structure of a HAR file can be displayes as an expandable tree. HAR Viewer Schema You can also see HAR JSON Schema describing its structure and used to validate log files before preview. HAR XML Schema is also available (provided by Paul Slauenwhite). Drag and Drop In order to preview HAR files you can paste the source into a text box or drop the file directly from you file system on to the page. HTTP Request Details Explore details of recorded request. Every bit of information stored in the HAR log is accessible from within the preview. Statistics HAR Viewer also analyzes the input HAR file and displays some statistics about transferred data. Page Load Timeline In case when a single HAR file recorded multiple page loads (or multiple files have been dropped onto the viewer) you can see a timeline of all the page-loads. Explore statistics by selecting individual pages (Ctrl + Left Click). HAR Files Online HAR Viewer uses JSONP (*.harp) to preview HAR files that are available online even on different domains. Customize HAR Viewer provides a public APIs that allow you to customize look and feel of viewer's UI. This way you can easily adapt it when embedding into your system. One of the tools you can use to create a HAR log is Firebug. You have to also install Firebug extension called NetExport. HAR Viewer can be customized through available APIs. You can remove existing tabs you don't need when embedding HAR Viewer in your system, hide some toolbar buttons that are not necessary in your production releases, etc. HAR Viewer supports JSONP and so, it's possible to load log files from different domains. This allows linking your online logs and preview them automatically within the viewer. See live example. The Content of a *.harp is HAR enclosed within a callback function. The link displaying a *.har file (using the viewer) must specify URL of the file in an inputUrl parameter. A custom name of the callback function can be specified in a callback parameter (by default it's onInputData). HAR Viewer is also distributed as a Chrome packaged app on the Chrome store (source available). HAR Viewer is an open source released under BSD License and it's already incorporated in to several projects (see the list below). Check also HAR Adopters page. Did you also included HAR Viewer into your project? Please, let me know and I'll update the list! Mobile test site for 5o9 Inc. Are interested in android browser performance analysis? See this site that shows mobile HAR reports. Show Slow is an open source tool that helps monitor various website performance metrics over time. WatchMouse uses HAR as the internal storage and HAR Viewer for displaying captured data as a waterfall. Cross Browser Testing is recording network activity during live tests and using HAR Viewer to display results. AlertFox is a revolutionary new browser-based monitoring service that is capable of keeping tabs on the function and performance of all websites, even those that use AJAX, Flash, Flex, and Silverlight.